This is not really an effect, but simply, as the name states, a line selector / switcher. However, it does have a “boost” capability and allows for some neat tricks, so it woudn’t be wise to dismiss it as a simple “switch”. 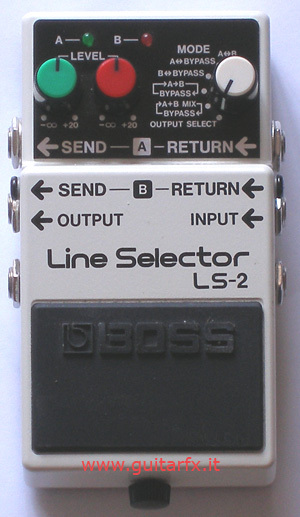 There are 3 controls: two are volume levels and the third is a “mode” knob, which has six postions. Two different color LEDs are used to indicate which output is active. One last note, this pedal has a DC out too: this means that it can be used with an external AC adapter and a cable to supply power to other pedals.